Does this dog look crazy or what? I’m starting to think that my purpose in life is to entertain Sammy. He certainly thinks so! 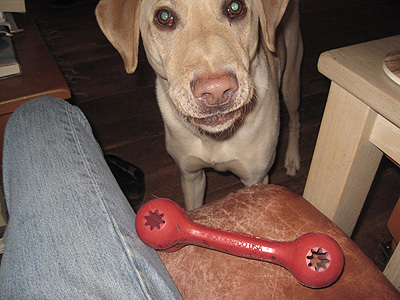 When we get up in the morning, he immediately grabs whatever toy is laying close by and rushes up to me with it, sometimes throwing it at me while he wags his tail and looks expectant (or crazy – see photo). He follows me around the house just in case I suddenly do something fun. When I sit down to put my shoes on he and Molly go crazy. Molly just rushes up and bowls me over while I’m sitting on the stairs lacing my shoes. Sammy runs around throwing his toy or mock-killing it. I’ve been taking the dogs out in the garden with me while I work and letting them roam free in the big garden complex. Sammy tried to escape a few times but he has settled down now and behaves pretty well. I’ve had to shoo him and Molly out of the beds a few times, and the other day Sammy snuck into the big veggie bed and stole a huge chunk of petrified cow poo compost. Good news is that kept him entertained with vigorous chewing for about an hour, while Molly looked on mournfully. Needless to say, kisses were out that day! Yesterday, after some random stick chewing and tug-of-war with Molly, he suddenly became crazed and ran around the garden like a maniac. Luckily I’ve trained him to stay out of the beds (mostly) so no damage was done. A couple of times a day I take them out into the backyard for a vigorous came of fetch. Sammy may or may not play along, and Molly could usually not be bothered. She gets excited for a few minutes but quickly settles down to chew on a stick. They’ve been finding all sorts of interesting things to chew on since our roof has been under construction because our builders will throw things off the roof and clean up at the end of the day. I’m sure Sammy has had his fill of foam insulation. I don’t really mind being a dog wrangler because I also get to be a dog cuddler. Molly will cuddle anywhere, anytime, probably because she’s knows what it’s like to be in dog prison (the shelter). Sammy takes a little more convincing. I’ll call him over to me and he walks over with his head hanging down like I’m going to beat him. I’ll never understand this since he’s been pampered by us since he was 3-1/2 months old. Sometimes he voluntarily comes over and put his paw up on my lap and lets me pick him up for a good cuddle. He just doesn’t like admitting he has a soft, gooey center! I’m pretty sure they were planning it from the moment they saw me take the chicken breasts out of the freezer. I usually put meat in the oven to thaw because so far none of the animals in the house have learned how to open the oven door. Yet. When I checked the chicken it wasn’t quite ready for cooking so I set it in a pan of warm water in the sink. Usually I cover it with a cast iron pan lid which is heavy enough to deter the rodents, but this time I neglected that step. Big mistake. I went outside to do a bit of gardening and came back in about 45 minutes later. I had the dogs outside with me, and I let them go in the house while I took some flower pictures in the garden. I came inside and looked in the sink…the pan of water was there, but no chicken. I had a sinking feeling in my stomach as I asked my husband if he had moved the chicken. The answer was no. Uh oh. That’s when I noticed the plastic bits on the floor. Uh oh again. Not surprisingly, all the animals were in hiding, except for Boots. [Why should I hide? I didn’t do anything wrong. Mother is being hysterical about the stupid chicken. – Boots] I checked around for the rest of the chicken package and when I didn’t see it I went out to the back yard, the final resting place of many liberated food items. Sure enough, Sammy was out there on the lawn and he looked up at me, looking VERY guilty. When I called his name he wagged his tail and came running up to me with his guilty, sideways crab run. I looked over the deck railing and there was the chicken package, minus the chicken. At least this time he didn’t eat all the plastic. I figure what happened is that Boots dragged the chicken out of the sink. I don’t know how she did it because the package weighed more than she does! [It was easy – Mother is so clueless. – Boots] She probably ate her fill while we were out in the garden and when I let the dogs in the house Sammy grabbed what was left and ran.